This collection includes a palette of beautiful cultured pearls. Besides round golden white loose cultured pearls, there’s a strand of well-matched round whites and a strand of oval pastel colors. The qualities that determine the overall value of a natural or cultured pearl or a piece of pearl jewelry are size, shape, color, luster, surface quality, nacre quality, and—for jewelry with two or more pearls—matching. 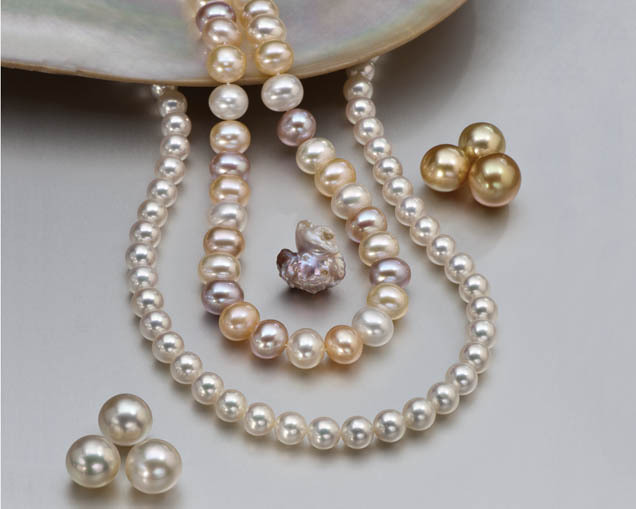 Size: When other value factors are equal, larger pearls are rarer and more valuable than smaller pearls of the same type. Shape: Round is the most difficult shape to culture, making it the rarest cultured pearl shape and—if all other factors are equal—also generally the most valuable. There are exceptions, though. 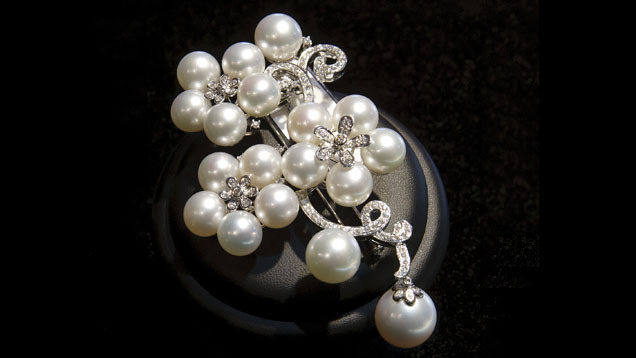 Well-formed pear, oval, or baroque (irregularly shaped) cultured pearls are also prized by pearl lovers. 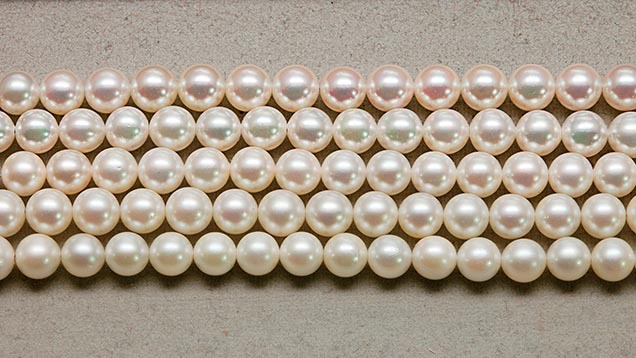 Different pearl types are held to different standards when classifying shape. Japanese saltwater cultured pearls are held to the strictest standards for shape. From top to bottom these strands are classified for shape as round, near-round, semi-baroque, and baroque. Color: Natural and cultured pearls occur in a broad range of hues. There are warm hues like yellow, orange, and pink, and cool hues like blue, green, and violet. 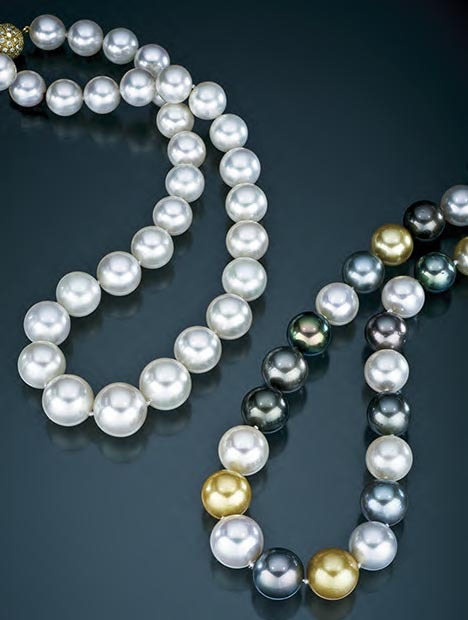 Pearls have a wide range of tone from light to dark. Pearl colors tend to be muted, with a soft, subtle quality. 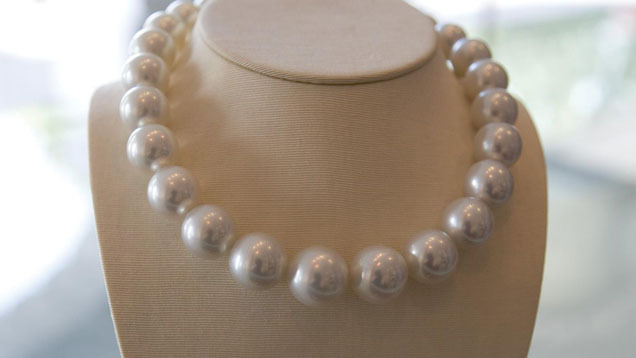 These Japanese saltwater cultured pearls display the white color most consumers associate with pearls. - Courtesy Paljoue International Inc.
Cultured pearls can come in a variety of amazing colors. 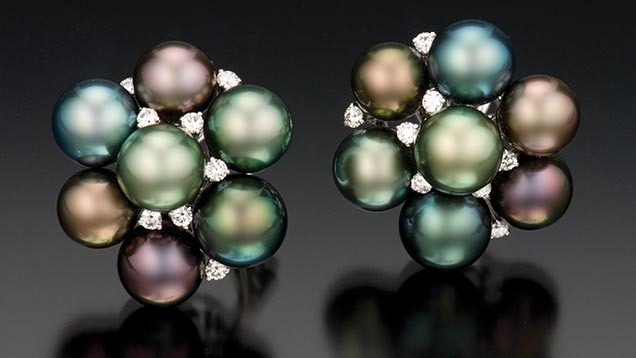 These Tahitian saltwater cultured pearls have a color intensity that’s almost like neon lights. - Courtesy Frank Mastoloni & Sons, Inc.
Pearl color can have three components. Bodycolor is the pearl’s dominant overall color. Overtone is one or more translucent colors that lie over a pearl’s bodycolor. And orient is a shimmer of iridescent rainbow colors on or just below a pearl’s surface. All pearls display bodycolor, but only some show overtone, orient, or both. 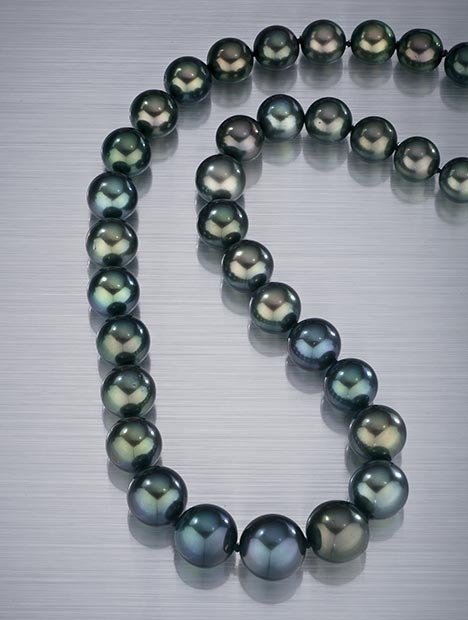 These natural pearls from French Polynesia have a dark gray to black bodycolor. The middle pearl shows pink and green orient, while the overtone of the pearl on the left is mostly green. The law of supply and demand determines the value of certain pearl colors at any given time. 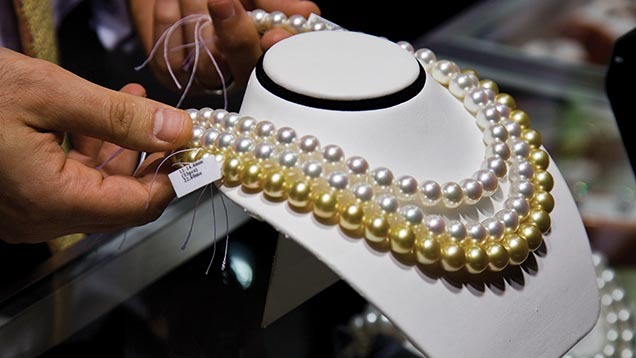 If supplies of high-quality pearls displaying a preferred color are low, their prices can rise to unusually high levels. Other complex factors, like fashion trends and cultural traditions, can influence color preferences. 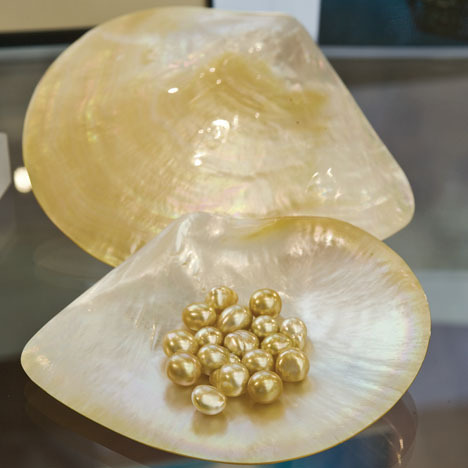 Luster: Of the seven pearl value factors, luster might be the most important. 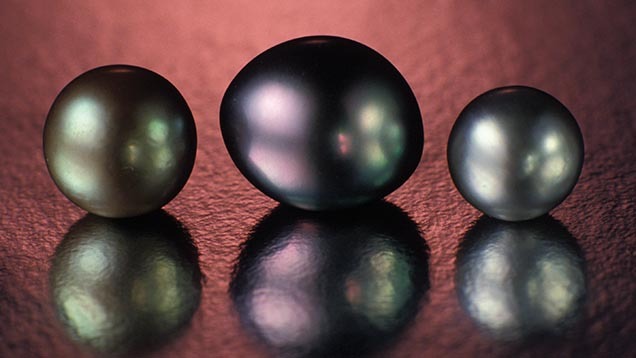 Luster is what gives a natural or cultured pearl its unique beauty. Within a pearl type, when other value factors are equal, the higher the luster, the more valuable the pearl. From top to bottom, these Japanese saltwater cultured pearls show excellent, very good, good, fair, and poor luster. The differences in the sharpness of the reflections between each adjacent strand are subtle but still noticeable. Surface quality: Like colored stones, most pearls never achieve perfection. Some might show abrasions that look like a series of scratches on the surface, or a flattened section that doesn’t affect its basic shape, or an irregular ridge that looks like a crease or wrinkle. If surface characteristics are numerous or severe, they can affect the durability of the pearl and severely depress its value. 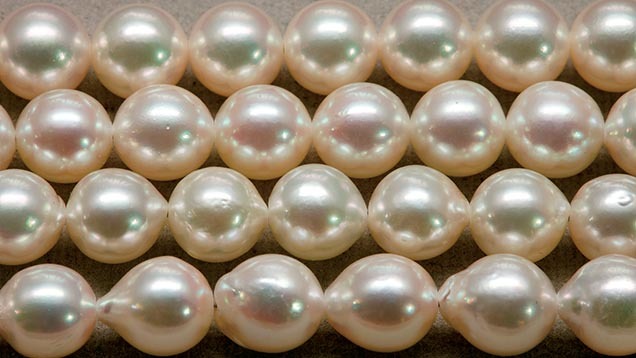 Surface characteristics have less effect on the pearl’s beauty and value if they are few in number, or if they are minor enough to be hidden by a drill-hole or mounting. Nacre quality: Luster and nacre quality are closely related. If the nucleus is visible under the nacre, or if the pearl has a dull, chalky appearance, you can assume that the nacre is thin. This affects the luster as well as the durability of the pearl. Matching: Jewelry designers sometimes deliberately mix colors, shapes, and sizes for unique effects, but for most pearl strands, earrings, or other multiple-pearl jewelry, the pearls should match in all the quality factors. with its assorted hues, the multicolored strand is also considered well matched.